When Julia Margaret Cameron photographed her intellectual heroes such as Alfred Tennyson, John Herschel and HenryTaylor, her aim was to record ‘the greatness of the inner as well as the features of the outer man.’ Another motive was to earn money from prints of the photographs, since her family’s finances were precarious. Within her first year as a photographer she began exhibiting and selling through the London gallery Colnaghi’s. She used autographs to increase the value of some portraits. Prince Dèjatch Alamayou was the son of an Ethiopian emperor who committed suicide rather than surrender to the British in 1868. The orphan prince came to live on the Isle of Wight, where Queen Victoria took a particular interest in him, paying for his education and allowing him to be buried at Windsor Castle when he died of pleurisy aged eighteen. Cameron took this photograph of Alámayou during one of his visits to Queen Victoria at Osborne House, Isle of Wight, in 1868. Probably responding to public interest in the orphan African prince, Cameron has presented her subject as a melancholy and romantic figure. The photograph was initially printed in large format but was reproduced in the form of cabinet cards and cartes de visite. Photograph of a seven-year-old boy (Prince Alámayou), seated, wearing a white shirt and necklace with large pear-shaped pendants. A shield has been positioned behind the child who looks off to his left whilst holding up a doll on a toy couch. The same shield appears in a Cameron photograph of Captain Speedy (19-1939). Below photograph, on left: 'From Life Registered Photograph July 1868', on right: 'Julia Margaret Cameron'. Below, centre: 'Dejátch Álámáyou' / [Text in Amharic?] / King Theodore's Son'. Cat. no. 1123, p. 456. Weiss, Marta. Julia Margaret Cameron: Photographs to electrify you with delight and startle the world. London: MACK, 2015, p. 112. 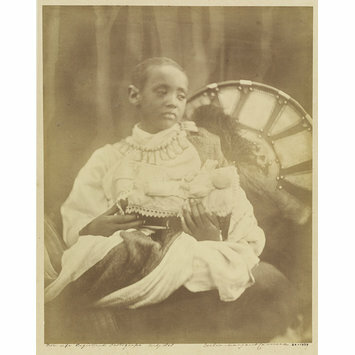 Prince Dèjatch Alámayou was the son of an Ethiopian emperor who committed suicide rather than surrender to the British in 1868. The orphan prince came to live on the Isle of Wight, where Queen Victoria took a particular interest in him. Photographs of the prince were widely circulated and he was perceived as an exotic and romantic figure. 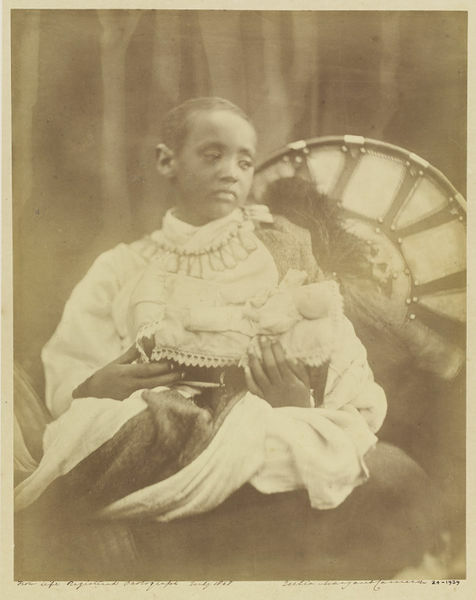 Prince Dèjatch Alamayou was the son of Emperor Tewodros II, who committed suicide rather than surrender to the British during the Abyssinian Expedition of 1868. The orphan prince came to live on the Isle of Wight. Queen Victoria took particular interest in him, paying for his education and allowing him to be buried at Windsor Castle when he died of pleurisy aged eighteen.